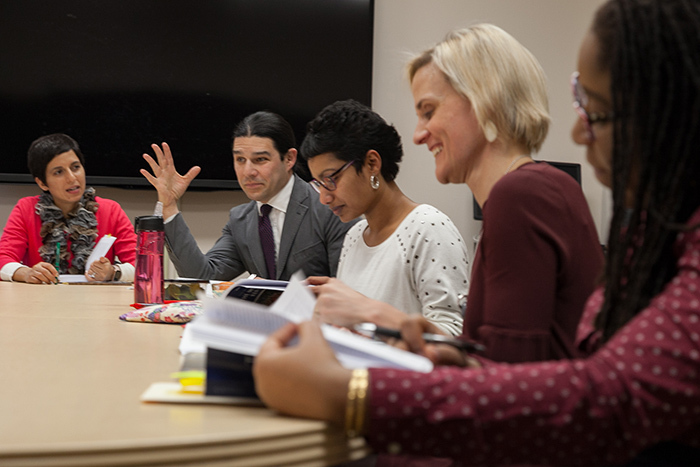 Members of the spring 2018 Citizen/Refugee Faculty Seminar held their first meeting Jan. 29. Photo by Carl Socolow '77. Dickinson students routinely swap ideas with faculty and students from across academic departments—that’s a hallmark of Dickinson's liberal-arts education. But until a few years back, there was no formal program bringing together professors from various fields for intensive study and discussion. So Seiler spearheaded a new kind of Dickinson professional-development seminar—one that has fed, and been fed by, campuswide conversation. Begun in 2013-14, the Faculty Seminar provides an opportunity for 10 professors per semester to move outside of their departmental circles for interdisciplinary discussions and events around a single theme, chosen jointly by the Faculty Seminar subcommittee and the Clarke Forum for Contemporary Issues. A new faculty group convenes every semester, and each member commits to 10 hourlong sessions and attends several lectures by outside experts. Some seminars, centered on a civic engagement theme, are funded by a grant from the Andrew W. Mellon Foundation, which supports one 12-member seminar per year through 2020. In previous years the Faculty Seminar has examined sexuality studies, food, disabilities, mass incarceration, societal limitations, race, language, water, war, media/technology/civic engagement and big data, and each one offered participants new approaches to their work, says Seiler. During the 2013 seminar, for example, he discovered surprising differences between what a biologist means when using the term “race” and the definition he uses as a cultural historian, but also "was blown away" by the ways that colleagues in the computer-science and music departments engaged with the issue. Now in its fifth year, the Faculty Seminar has marked several milestones. Last winter, three participants in a seminar on media, technology and civic engagement took a trip to Cameroon to study and discuss those issues in the context of Dickinson’s signature West African study abroad program. Faculty members in a disability-themed seminar shared findings with the greater campus community through a 2016 Vantage points series. Last fall’s Faculty Seminar, Big Data, was the first one proposed and chaired by a science faculty member. A week into the spring 2018 semester, the Citizen/Refugee Faculty Seminar is already underway. Co-chaired by Assistant Professor of English Sheela Jane Menon and Associate Professor of English Claire Seiler, the current seminar draws participants from the Africana studies, American studies, East Asian studies, environmental studies, political science, psychology and sociology departments. Eleven books are on the reading list, reaching into geography, globalization and population studies, political history, immigration, domestic and international law, Syrian art and culture and issues relating to the Asia Pacific rim. The group also will study poetry on citizenry and the refugee experience. As in the past, spring 2018 Faculty Seminar participants will attend related Clarke Forum events. Many of their students will do the same, contributing to a campuswide, semesterlong conversation. New lines of thought and connections will likely emerge, and scholarly connections will be forged and strengthened, clearing possible pathways for future collaborative projects.